I cannot begin to express how excited I am about Thanksgiving! 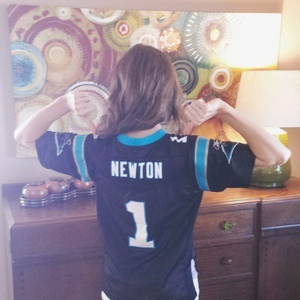 Come Thursday, I will be donning my Cam Newton jersey, eating fried turkey and enjoying some much needed family time. I hope you are gearing up for an equally festive celebration... even if you are a Dallas Cowboys fan. Thanksgiving tends to be a mad-rush, headlong dive into the holiday season. And prepare as I may, it has a way of sneaking up on me. Things get lost in the holiday shuffle, and I imagine that many of you experience that too. That is why I am reminding you to shop small next Saturday! Prepare - Download free materials and claim a free listing on shopsmall.com. You will also want to firm up the details of any discount or special promotion that you intend to offer on November 28th. Promote - Let everyone know that you are participating in Small Business Saturday! Post signs, send an eblast and spread the word on social media. Use hashtags like #shopsmall, #smallbusinesssaturday and #charleston. That last one will link you to others in your area, and you can even try something more specific, like #shopsmallchs. Hashtags can be used when sharing photos of event prep/setup. You can also use them to preview your offer (i.e. "Visit us on Saturday to take advantage of a special #shopsmall discount! All cupcakes BOGO free!"). Keep the Momentum Going - Share photos and live updates on Saturday, and encourage patrons to share photos/tweets/status updates too. You can grease the wheels by offering free promo items or a fun photo prop. Keep the party going all year long with occasional #shopsmall Saturday discounts and offers throughout the year. We look forward to seeing what your business has in store for Small Business Saturday! All Rooted ID team members do however, happily support Small Business Saturday.